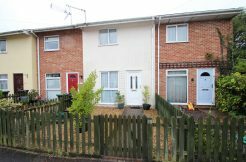 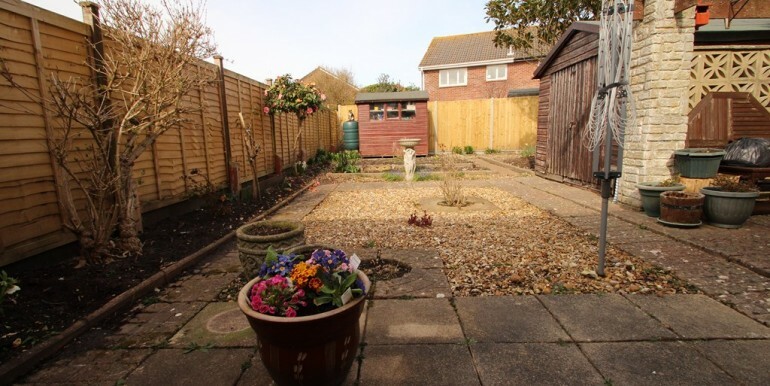 A well presented three bedroom semi detached house situated in a quiet cul-de-sac position, benefitting from a conservatory, good sized rear garden and a single garage. 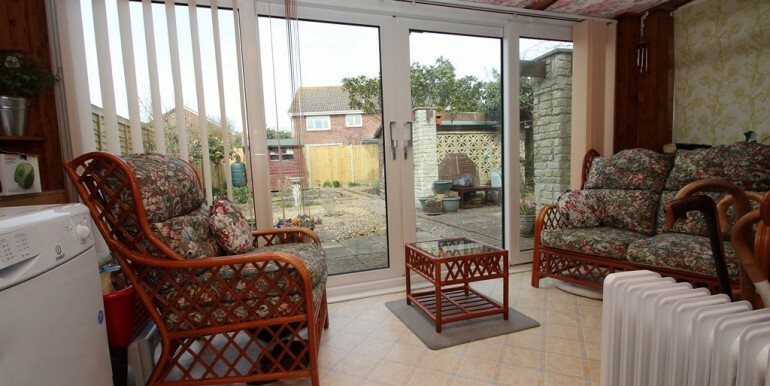 Access via a UPVC double glazed door leads into the entrance hall where stairs rise up to the first floor landing and a glazed casement door leads into the living room. 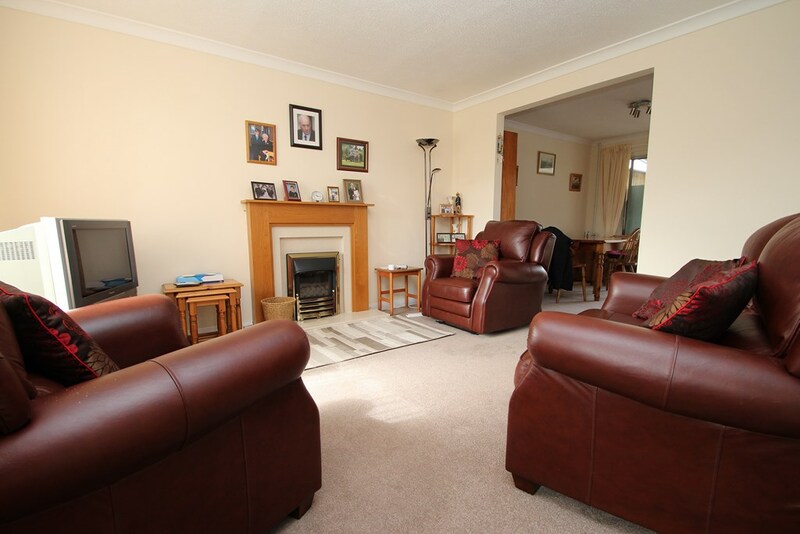 The living room is of a good proportion, overlooks the front aspect, has a feature central fireplace with an inset ‘living flame’ gas fire, there’s a under stairs storage cupboard and a squared arch leads through to the dining room. 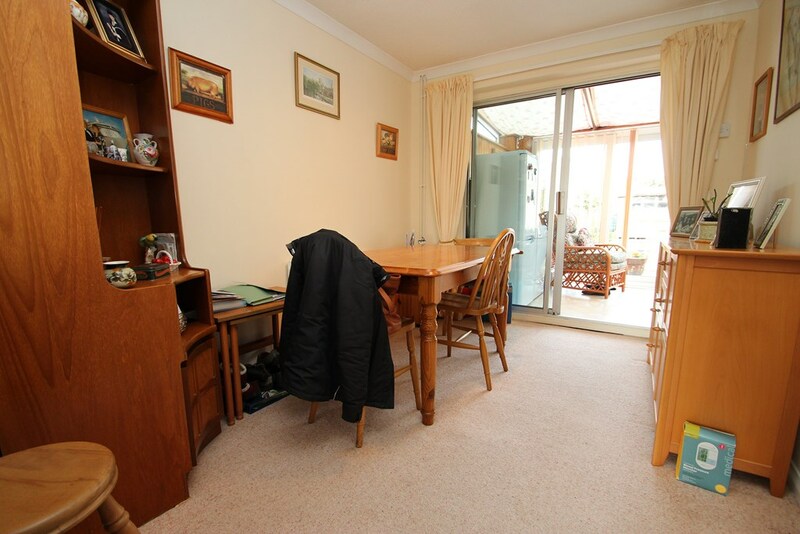 The dining room is of a good size, a sliding patio door leads through to the conservatory and a further door leads into the the kitchen. 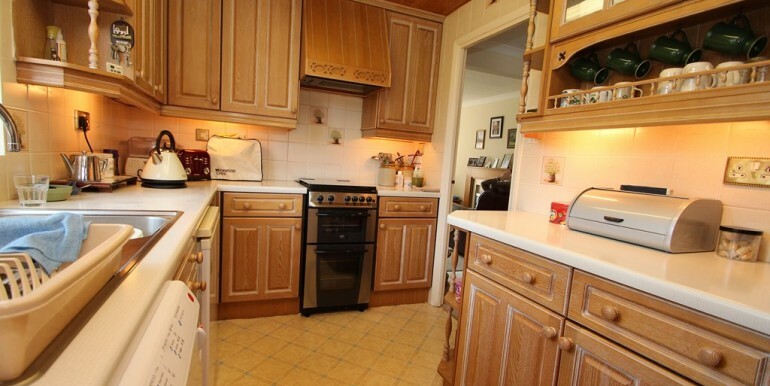 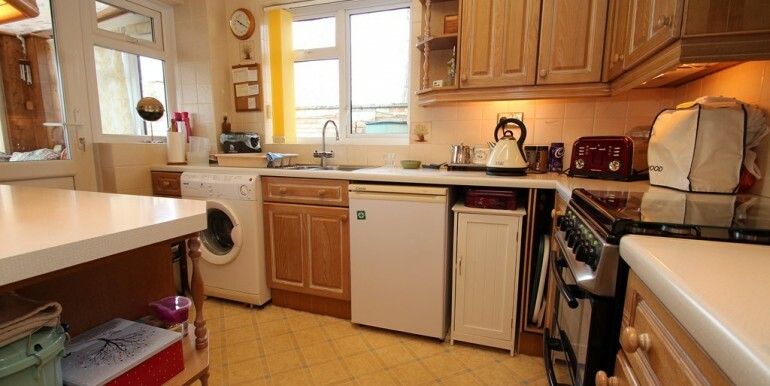 The kitchen has a good range of wall mounted and floor standing units surmounted by roll top work surfaces, there’s a stainless steel one and a half bowl sink unit with mixer taps and a side drainer, space and plumbing for a washing machine, space for an under counter fridge, space for a cooker with an extractor hood above, a UPVC double glazed casement door leads into the conservatory. 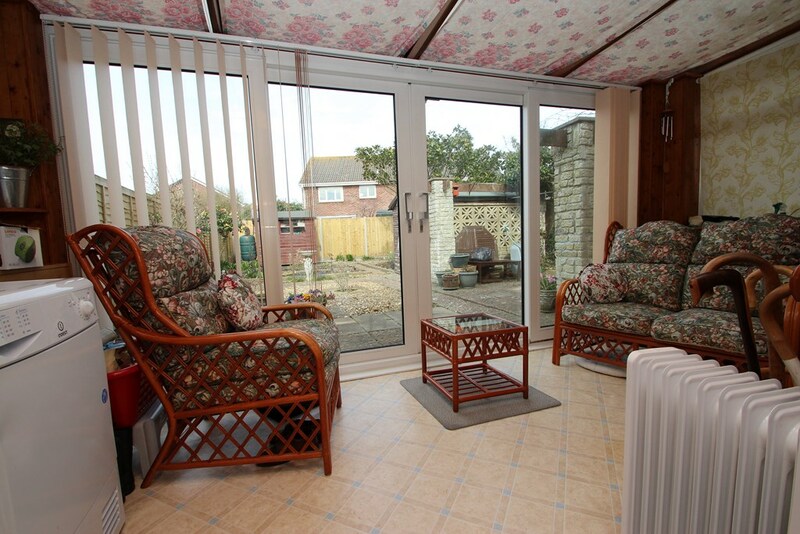 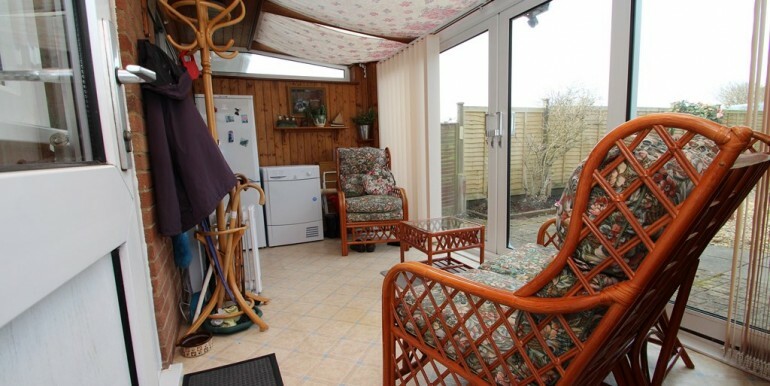 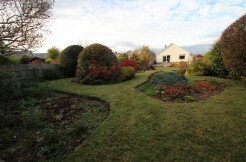 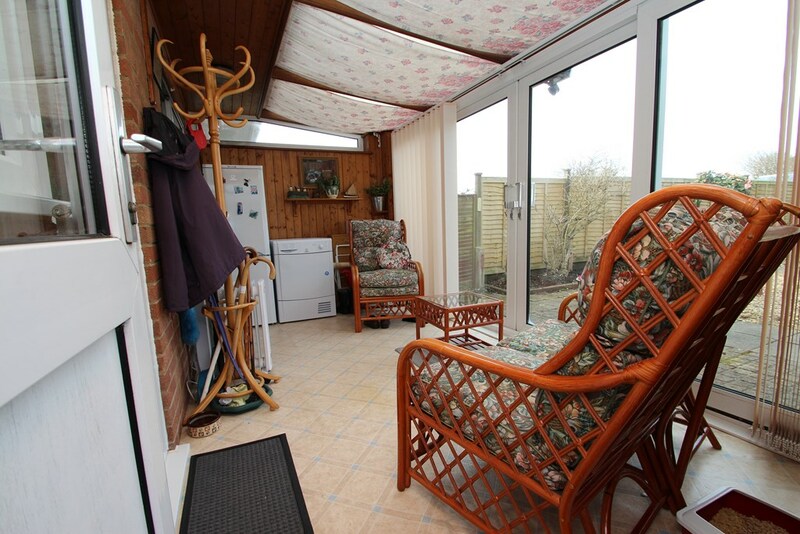 The conservatory is of a good size, spanning the width of the house, sliding patio doors lead out to the rear garden. 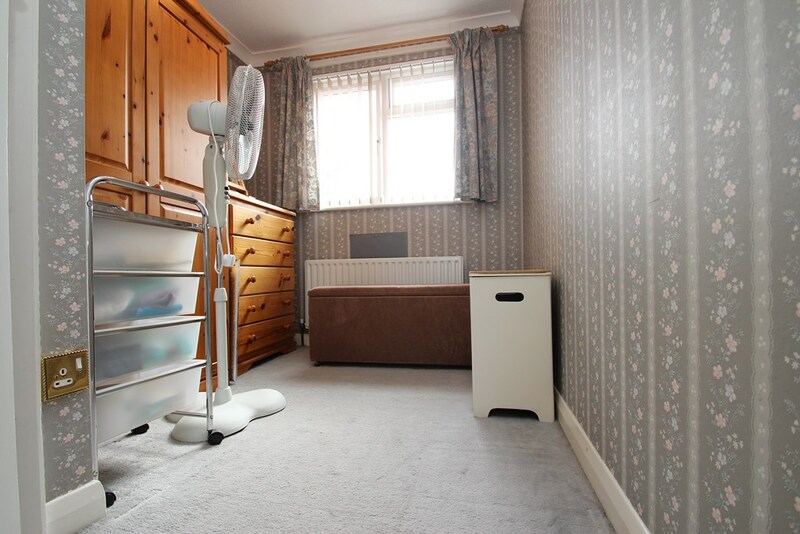 The first floor landing has a hatch up to the loft space, doors lead into the bedrooms and bathroom. 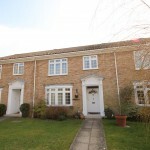 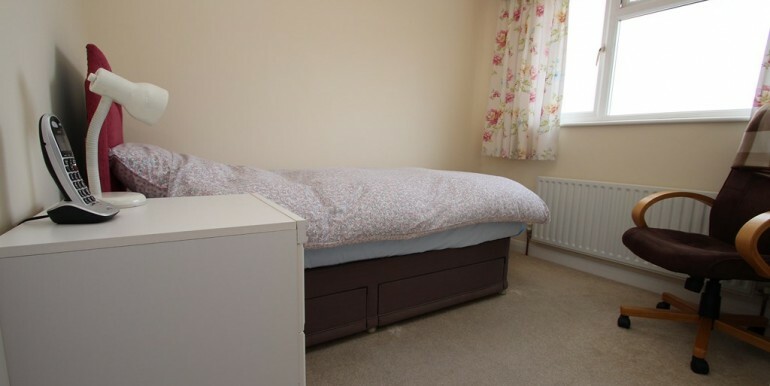 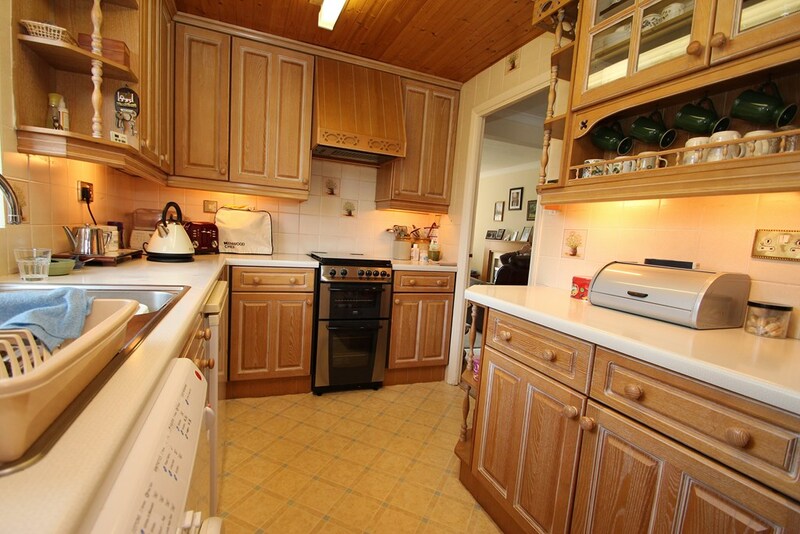 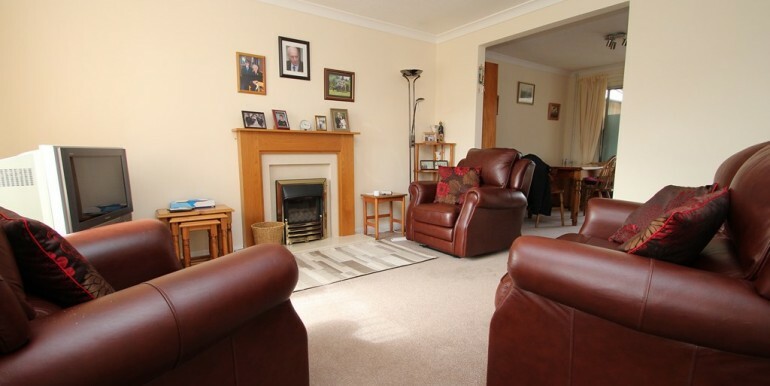 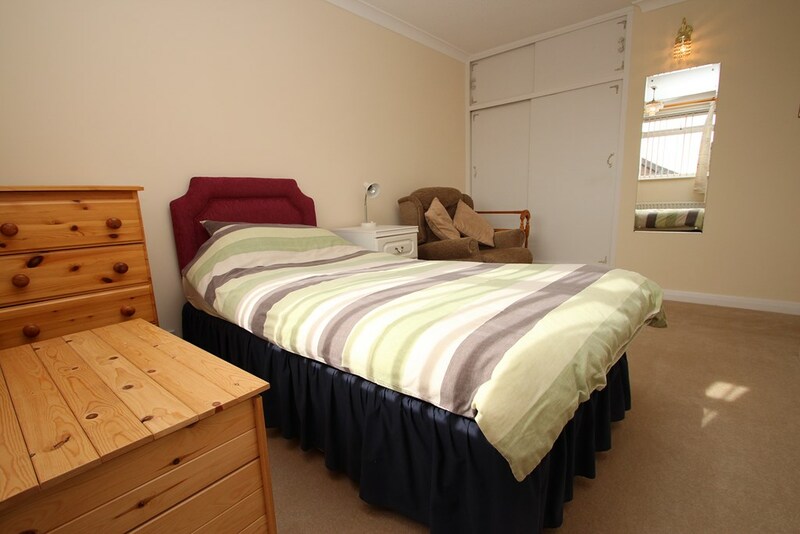 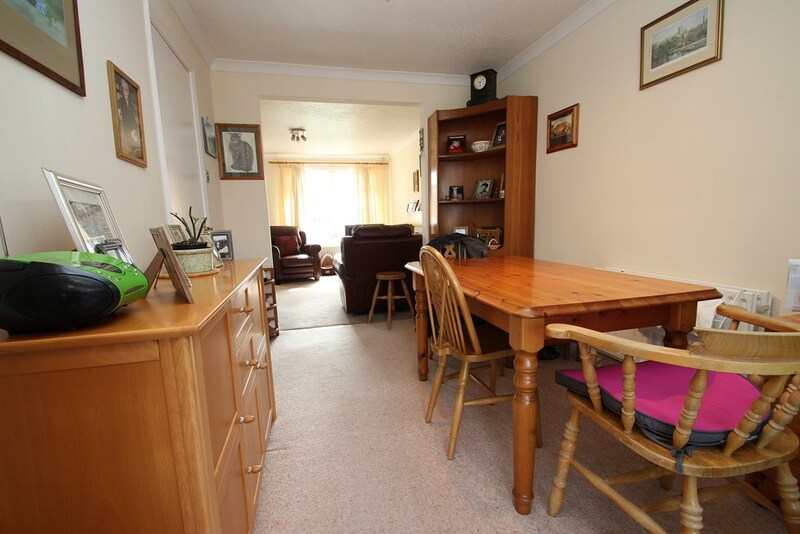 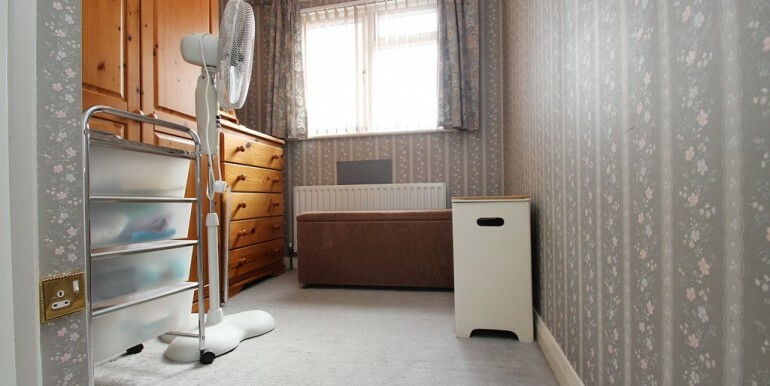 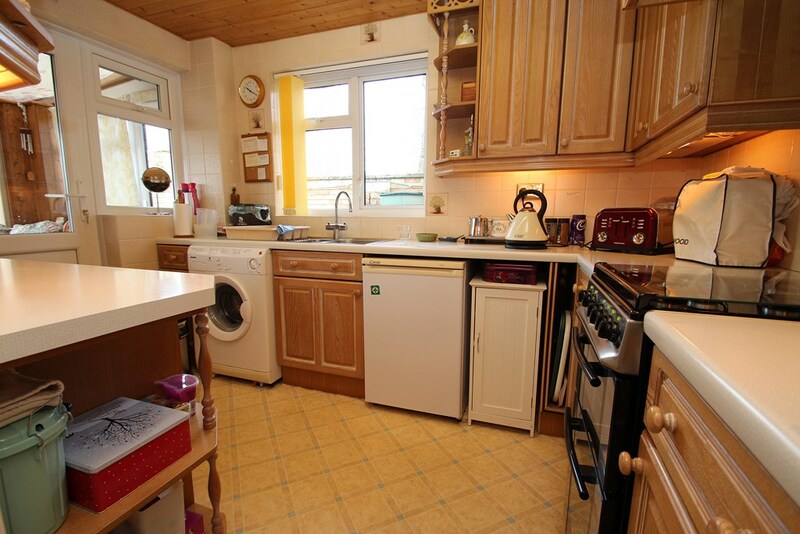 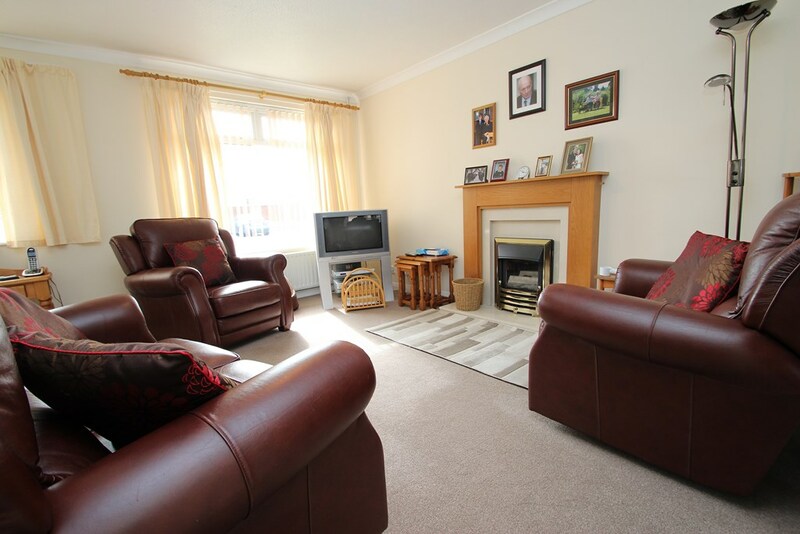 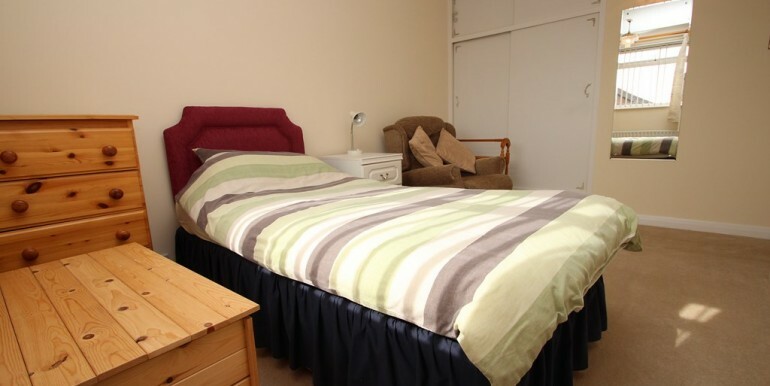 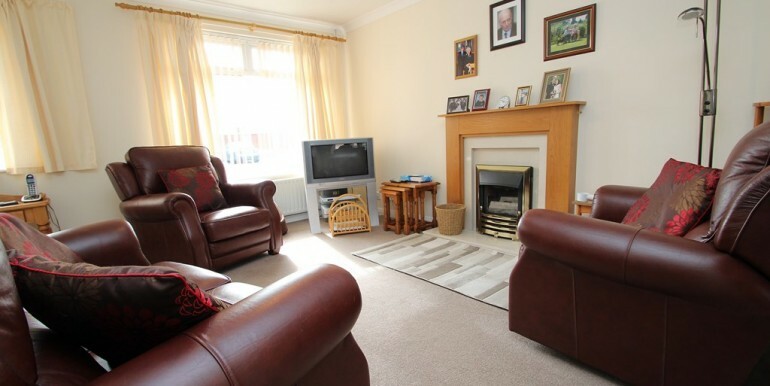 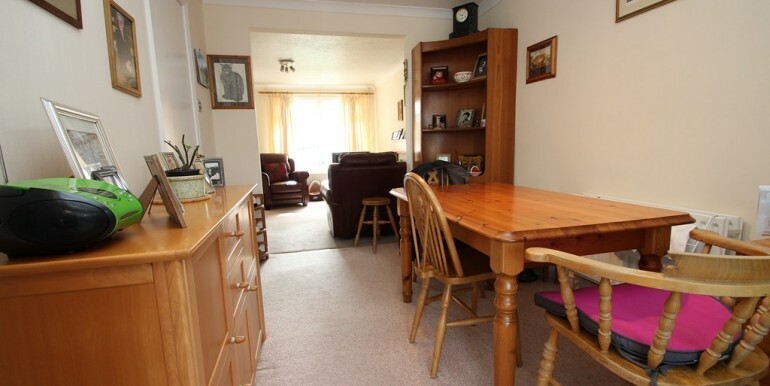 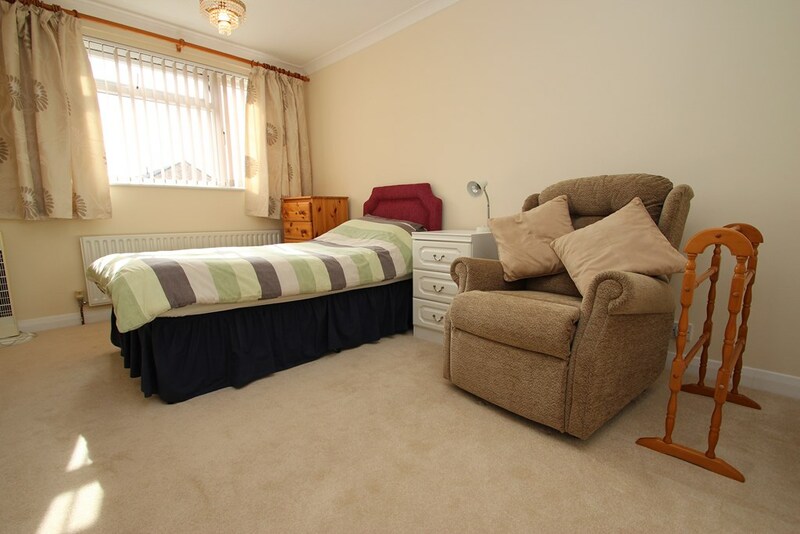 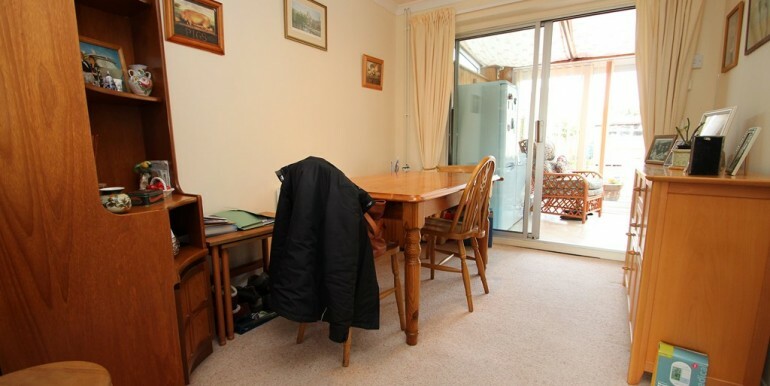 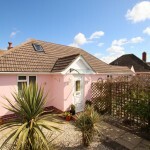 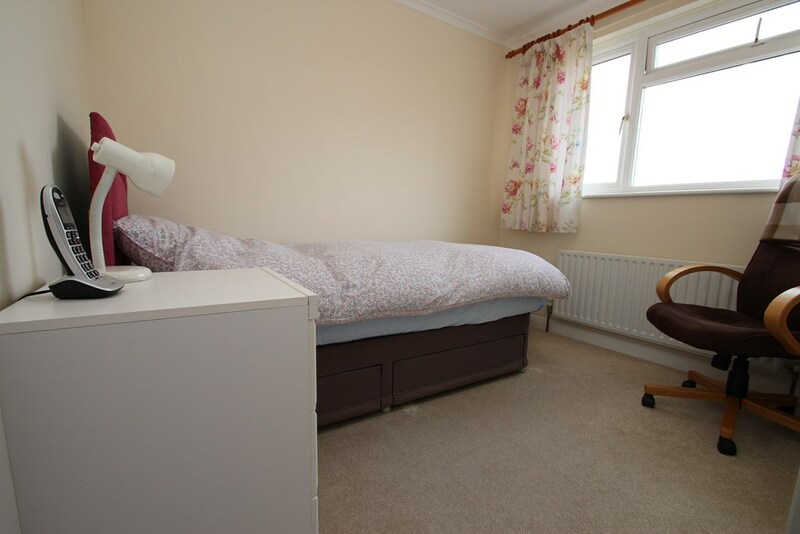 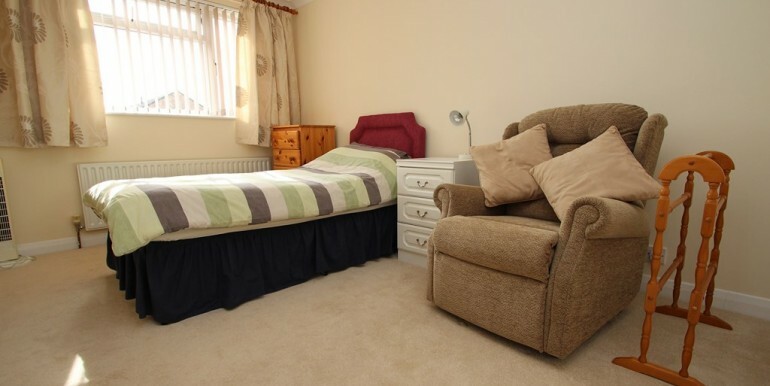 The main bedroom is a good sized double room and benefits from built in wardrobes, bedroom two is also a double room with built in wardrobes and enjoys views across playing fields, Bedroom three is a single bedroom and has a built in cupboard. 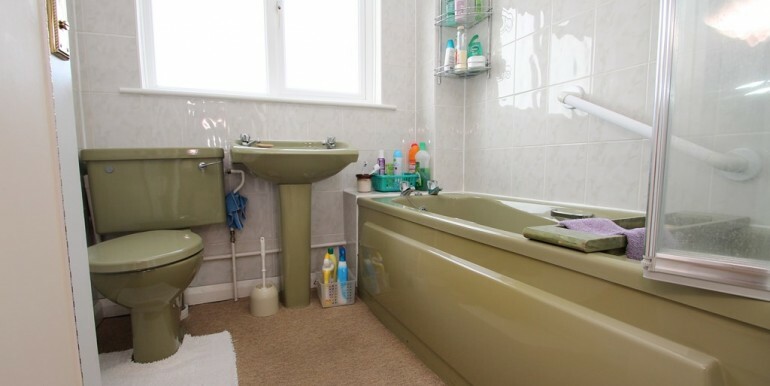 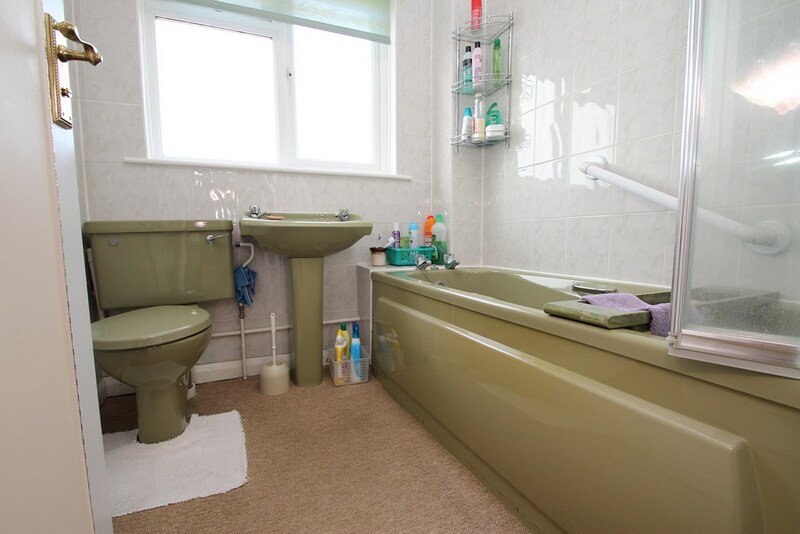 The bathroom has a panelled bath with a wall mounted electric shower above, pedestal wash hand basin and low flush WC. 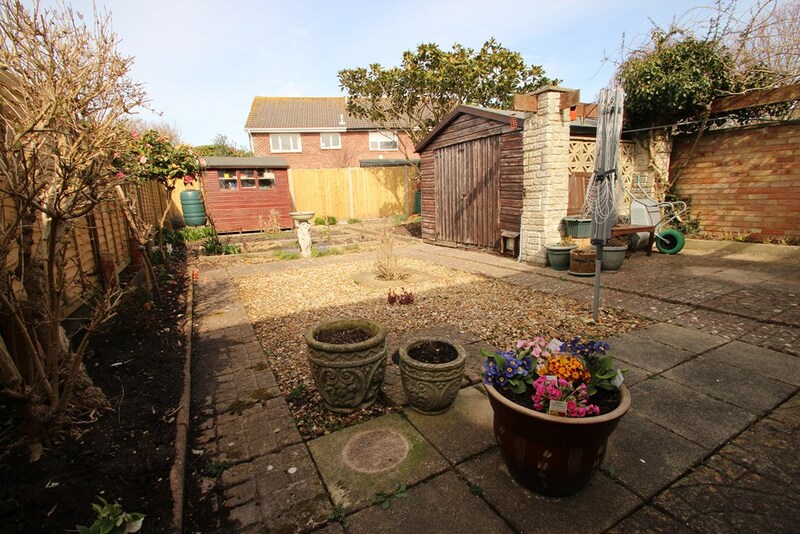 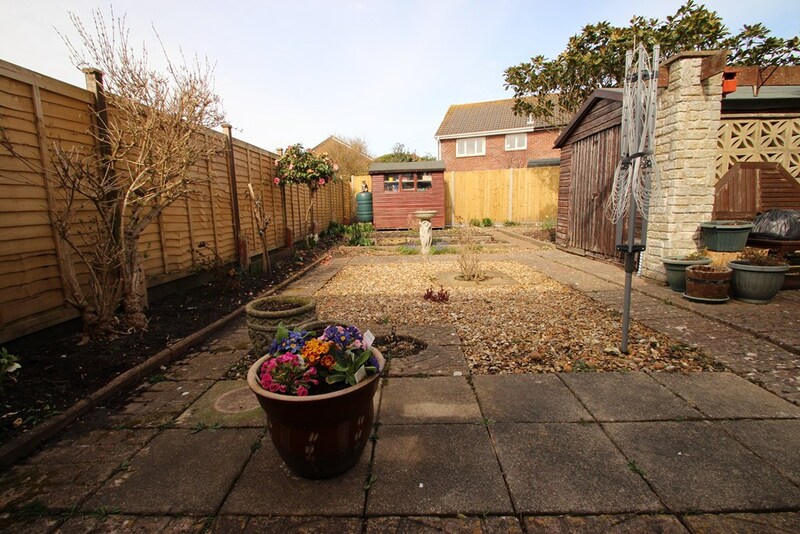 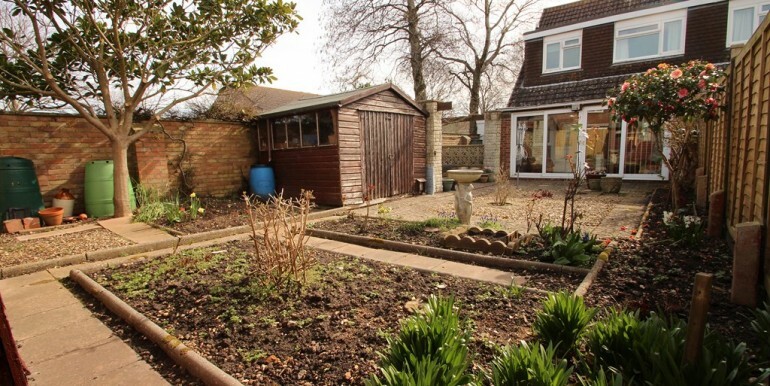 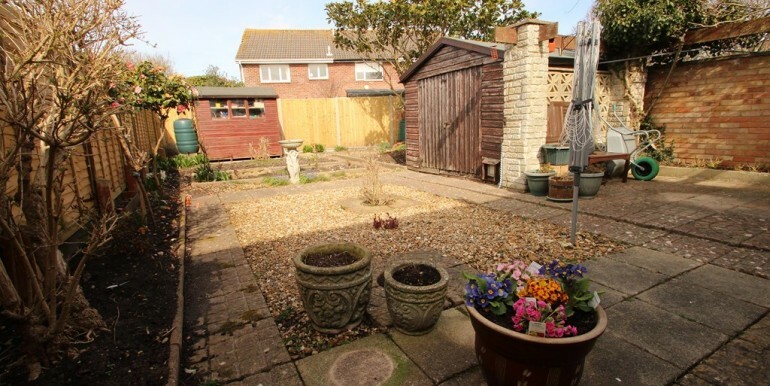 The rear garden which is of a very good size has been laid mainly to paving with an area laid to shingle for ease of maintenance, raised borders display a colourful range of plants and shrubs, there are 2 good sized timber built sheds and rear access into the single garage. 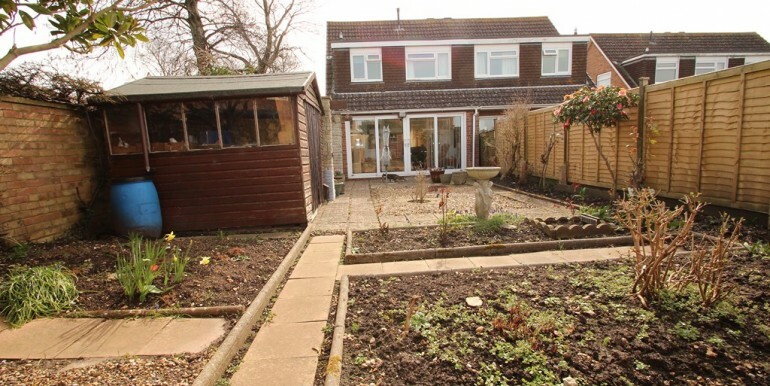 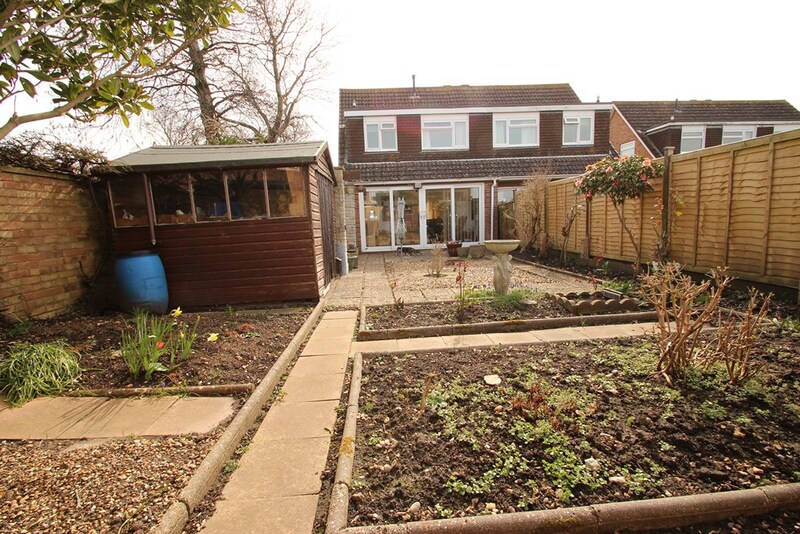 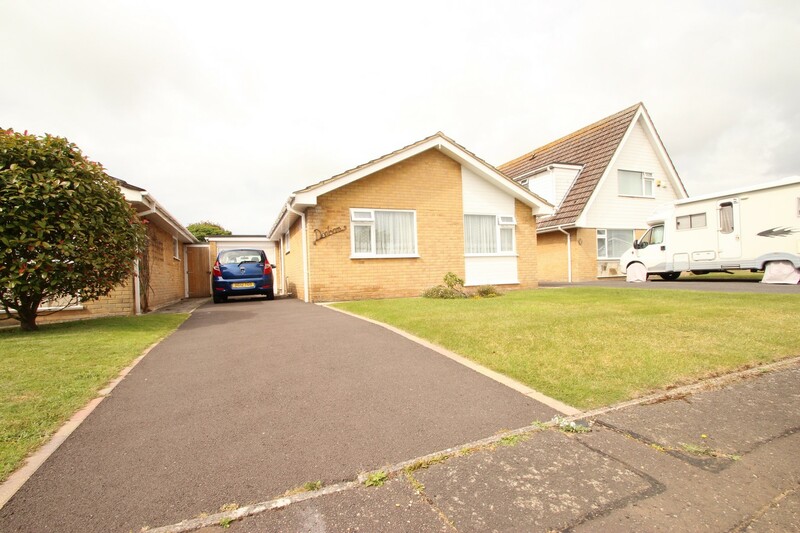 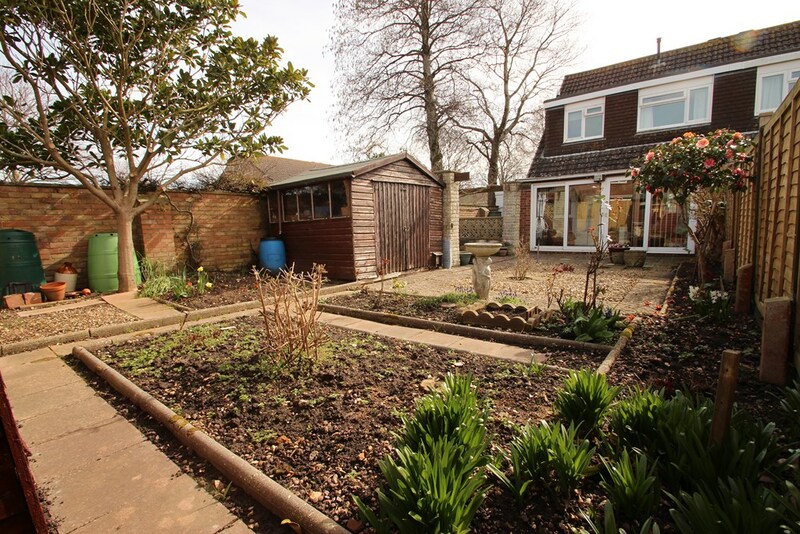 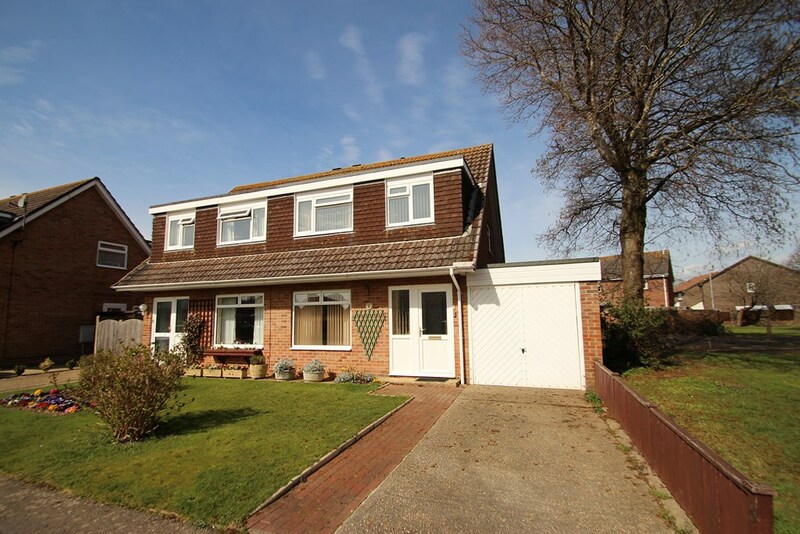 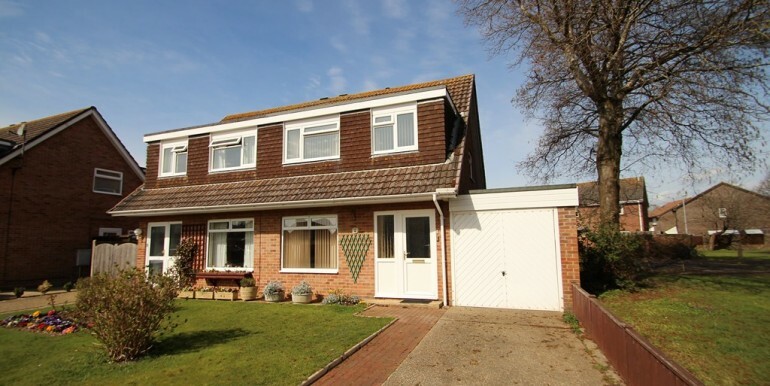 The front garden is laid to lawn, the driveway offers off road parking and leads to the single garage with an up and over door, power and light.